I think that’s got to be the longest stinkin’ name for a blog entry I’ve ever written, in all my 5 plus years of blogging. The more and more I do dutch oven cookery, the more I’ve come to realize that becoming skilled at dutch oven cookery is really more about becoming a real chef that happens to use a dutch oven as their cooking system of choice. Now, in saying that, I am, by no means, claiming to be a chef. I’m learning to cook, and along the way, some folks tell me that they like what I cook. Sometimes. Well, they usually do, because the times that I flop, I usually don’t force other people to eat it. That’s another blog for another day. What I AM saying, however, is that as I learn “How to Cook in a Dutch Oven”, I’m seeing more and more that what I’m really learning is more “How to Cook” in a dutch oven. And I keep getting closer and closer to the time when I think I’d like to take some culinary arts classes. I mean, there are some basic cooking skills I keep feeling more and more like I should know. Teaching myself is one thing, following recipes is one thing, knowing what you’re really doing is another altogether! What I’m leading up to is that tonight, I took a major step forward in learning “How to Cook”. I made my own pasta from scratch. It’s all John’s Fault. See, he got me started when, over at Mormon Foodie, he blogged for a whole month about pasta, and even made some of his own. That inspired me. I knew we had one of those cool roller things, so this was going to be easy. But then, I couldn’t find it. That’s OK, though, because I had remembered in one of my books, a series of instructional photos on how to roll and stretch out pasta. I dug for it, looked it up, and I couldn’t make any sense out of it. I read it and re-read it, and studied the pictures. I could tell this was gonna be a “You had to be there” kinda things. But anyway, I studied the videos, and figured out what she was doing. Then tonight, I tried it myself! I did have some troubles with the sauce, because I couldn’t find a sauce recipe that we had all the ingredients on hand for (I don’t like to go shopping on Sunday). But I finally found one, and tweaked it a bit. But I’ll talk about the sauce later. First, the pasta! In retrospect, I’d probably used a little more garlic powder and a third egg instead of water. I didn’t use semolina flour. I’ve heard that regular flour works well, and that was my experience. Maybe next time I’ll try it. I’ve heard of some people mixing it half and half. Anyway. The first thing to do was to mix it all up. In the video, the lady makes a volcano of flour and dry ingredients, and then puts the eggs in the middle, then mixes it up with a fork. I tried that and it got all over. Still, I managed to mix it all up and not get it on the floor, but the area I was scooping kept getting bigger and bigger. Once that was all mixed, I kneaded it for about 8-10 minutes, just like I knead bread, shaking bits of flour on the table as I went. Then I set it on the table top to rest for a while. Then, I went to get my stick! About a week ago, as I had been preparing for this event, I was at Home Depot, and I bought a yard-long, 1 ½” dowel. After watching the videos, I could tell that a simple rolling pin wasn’t gon’ cut it. It would simply not be wide enough, and that proved to be true, even though I didn’t make as much as the lady in the videos. Still, I could tell that three feet was gonna be too much for my little kitchen counter, so I cut about a foot off of one end. I started just like in the video. I rolled it out to a disc maybe a little under a foot in diameter just like I would do with a normal rolling pin. Then I rubbed on a light layer of flour, flipped the far edge up and over and rolled it up and started the rolling and stretching process. Here’s how it works: I applied a bit of rolling pressure as I moved the stick towards me. Then I released the pressure and slid the stick (without rolling it) away from me. Then I rolled it towards me again. Actually, I was doing a bit of “back and forth” rocking motion as I rolled the stick toward me. 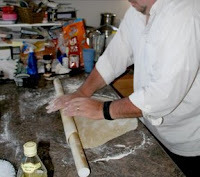 While I was doing this, I was moving my hands “outward” to help stretch the dough side to side. Then, I unrolled it, turned it a little, rolled it up again and worked it the same way. Just like in the video. Each time I unrolled it, I watch to see if it was sticking at all. If so, I smoothed on some flour. Gradually, it got thinner and thinner, and bigger and bigger. I gotta tell you, too, just how goooooood it smelled while I was rolling it out. Those herbs and the garlic had me in heaven. Finally, just like the video, I folded it up and sliced it. Really, I probably sliced it too thick to call it true fettuccini. Sue me. After slicing it, I lightly tossed it with my fingers to separate it, and left it on the tabletop to dry a little. I didn’t let it dry out, though. I could have, but I didn’t. Then it wouldn’t have been pasta fresca, but rather pasta secca (fresh pasta or dried pasta). 20+ coals under each one. I started with the onion, the garlic and the mushrooms, sautéing them in one of the dutch ovens in a bit of olive oil. The other one had water on, so it could get boiling. I’ve found that it takes a while to get boiling, since it has to heat up the dutch oven on the way. I keep it covered, since it boils faster that way. Once the onions and the ‘shrooms were browning, I added the chicken. I like to keep the lid on when I cook frozen chicken this way, as it tends to steam the chicken and keep it moist. Once the chicken was cooked through, I added the butter and the flour. The butter melted, along with the oil, and made a bit of a roux. I added all the other ingredients, and let it simmer, stirring it often. This was all done with the lid off. Somewhere in all that, I checked and saw the water boiling. A pasta book I had been reading all along this whole adventure said to put the pasta in gradually so that it doesn’t stop the boil. Somehow I managed to forget that brilliant suggestion and dumped it all in anyway. It still cooked up fine. I put the lid back on to help it boil. I only cooked it for a few minutes once it started boiling again. I tested it for “al dente”-ness, and it was there! I drained the pasta in a colander in the sink and served it up with the sauce and parmesan cheese. It was fantastic! 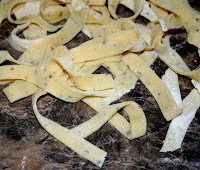 I also tasted several strands of the pasta by itself, and enjoyed the herbs and the flavor. It was yummy just as it was! The sauce was great with it, too. So, I learned an important lesson. Making pasta from scratch. I enjoyed it, too. It was work, but it didn’t take very long. I think next time, I’ll make more and dry some out. The results were certainly delicious! I'm well into cooking the Mother's Day meal! It's exciting. Not overwhelming just yet. We'll have to see how it all goes. Those of you that want to can follow the action on Twitter! Otherwise, I'll be posting the full write-up within a few days here at the Black Pot! For a long time, now, I’ve thought it would be a fun and unique challenge to do a big, fancy meal, for a lot of friends, completely in my dutch ovens. I finally chose a day and just started inviting friends. I chose the day before Mother’s Day, so that I could make it special for my wonderful wife. Appetizers: Sausage stuffed mushrooms with cheese and crackers. So, tonight, I laid out each course on a time table. I had to figure out when I would prep and cook each one. Otherwise, I would be an overwhelmed, nervous wreck by the end of the day. As it stands, it looks like I’ll be cooking starting at about 10:00 in the morning, and the pace will be pretty easy. I’ll never have more than three things cooking at any one time, and most of the time will have only one or two things cooking. The Salad and the cheese/crackers will be prepared the night before. Just for less stress. Then, at 10:00 I’ll start working on the Paradise Pie. At about 11:00, I’ll cook the sausage for the stuffed mushrooms, then I’ll prepare the filling. At noon, I’ll start on the bread, mixing and kneading. I’ll set that aside to rise, while I prep the veggies and put the soup on at around 1:00. At around 2:00 or so, I’ll get the roast on. Once that’s cooking, I’ll get the tables set up. I might do that earlier in the morning, or the night before, just to give me more time. Somewhere in there, the bread will probably have risen, so I’ll shape the loaf and put it in the dutch oven for proofing. By 4:00, I’ll probably be ready to put the bread on the fire. That’s also probably about the time that I’ll add the veggies to the roast. At around 5:00, it’ll be getting closer to Zero Hour, so things will start to pick up. I’ll put the mushrooms on to bake, and pull out the cheese and crackers. Then, folks should start arriving by about 6:00. At that point, I’ll pretty much just be serving. I will probably put the Paradise Pie back under a few coals for about 20 minutes to a half hour, just to heat it up again, then I’ll just ladle on the ice cream and serve it up! Now, of course, by writing this all out and telling all of you about it, I will have jinxed myself, of course, and it will all come crashing to a chaotic finish. But then, at least I’ll have something to blog about!